Madonna's hands tell us that she is a private person, rather secretive, suspicious and difficult to approach. Perhaps that is why there is a mysterious aura about her. One never really knows what is behind that steady smile of hers, what she is really thinking. The way she holds her fingers tell us this and more. The mount of Venus and heart line confirms that she doesn’t reach out to others easily and although she has a very warm personality, she can be distant at times. She has a good heart but it is reserved. energy. A comparison of her lines with the overall size and shape of her hand shows an imbalance. She has more will than the energy her body can provide her with. As a result, she could burn herself out, if she hasn’t done so already. I’ve read that she follows a strict health regimen and well, she needs it. If she didn't, then with the level of activity she has enforced upon herself, she could quite likely collapse. 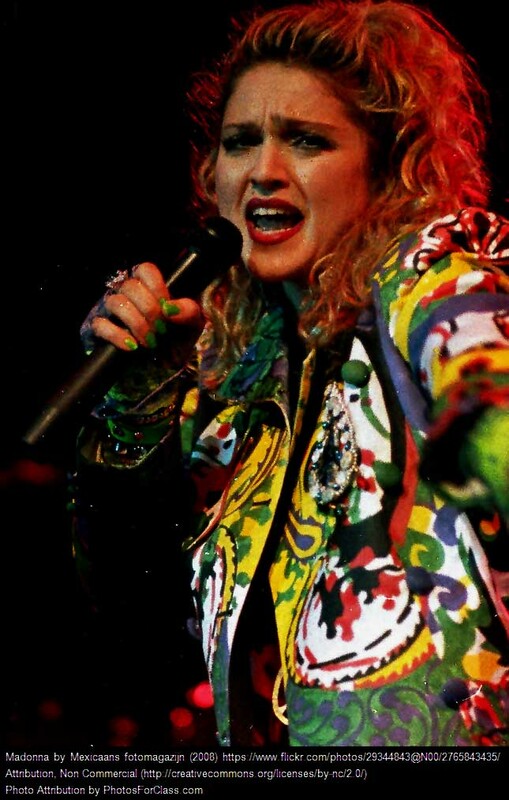 Madonna has a rectangular palm, long, slim fingers and a long, supple thumb which she holds close to her palm. She has well-developed mounts of Venus and Jupiter, as well as the upper mount of Moon. The finger of Saturn (middle finger) is bent, and the Mercury (little) finger is long, conic tipped and low set. She has long lines, both the head and heart lines, and a distinct gap between the head and life lines. control. Ambition and drive are both visible in her hand. Musical talent is very clearly seen on her hand, and this is not only because of the development of the upper moon mount in combination with Venus, but also her fine headline When this is backed by drive and ambition, and shrewdness which she has in plenty, the sky is the limit. Her talent is multi-faceted. Her assets are her ability to work hard, be focused, and her brilliant tact. What goes in her favour, what makes her a true artist is her flexibility and the ability to take in impressions and make them a part of herself. The shape of her thumb, the flexibility of her hand and fingers, the quadrangle, the texture of her hands as well as her fingers all tell us this about her. Her sensitiveness and impressionability. She is the kind of person who can absorb ideas quickly, and also get things done. 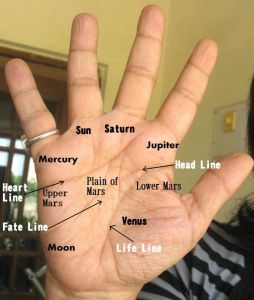 The square tips on her Sun and Saturn fingers show an ability to be quite practical in her career decisions. She can be impulsive and impressionable, and it is only her will which can help balance her personality, and keep in check the making of bold and sudden decisions. She is an original thinker and very independent, the kind of person who will do what she wants if she believes in it, without caring about what people think. The knots on her fingers, her first phalanges, as well as her fate line tells us that she has a plan and knows what her goals are. In fact, she is a thinker, however strange her decisions might seem to others. That she is individualistic everyone knows. It is collaborated by her hand, the way she holds her fingers. Such people carve out their own life by the dint of their strong focus and tenacity, they have a uniqueness that comes from being independent thinkers who are not afraid to tread unknown paths. However, there is cynicism in her nature, and her thoughts are not pure, in the sense that she can be quite negative and critical of everything and of people as well. She could think the worst of people. She is the kind of person who would find it difficult to be satisfied, and this is a weakness. Her thoughts could turn morbid on occasion. She would definitely think thoughts of death and failure, and could become disturbed. Overall, Madonna’s hand texture, the fineness of her lines, the shape of her thumb and mounts all point to the fact that she is refined, a person of delicate sensibility. She is certainly someone who could be considered a superior human being in this sense although living with her would not be easy. One cannot help comparing her hand with that of another music star, Michael Jackson. There is one remarkable similarity in their hands. More intensity that the body can bear. Related Reading: Michael Jackson's hands reveal his strengths and weaknesses or Kurt Cobain of Nirvana - hand reading or Rihanna's hand reading or Jennifer Hudson's hand reading. Or check out the label "Music Stars" or the other labels below this post. Yep, something really unique about them, and the fearlessness they have to be themselves.